I picked up a bag and slung it under the cart I pushed into the store. When I checked out with my other selections–a paltry few compared to the rest of the other shoppers, who were apparently preparing for the Apocalypse (or the Snowpocalypse, as it were), I decided to buy a second bag just in case. See, ice is a frequent enough occurrence that we freak out, but it’s not so frequent that we’re adequately prepared for it when it does happen. The last time we had an ice storm here, we had a couple of inches of ice, then a few inches of snow, followed by more ice. It shut down our schools for a full week, which NEVER happens here. It crippled the Metroplex during the most inopportune time while the whole world watched–during the Super Bowl. Here at my homestead, we were actually iced in. We could not leave our place even if we had wanted to. Why? We enter and exit our home from the patio as it is not practical for us to go through the front door. When we have ice storms, the uncovered patio turns into a giant ice sheet. Not wanting either my husband or me to bust our asses slipping and sliding around on ice, I felt it wise to invest a few bucks in some “Ice Melt.” Friday morning we’ll see if it was a wise investment or if it was a waste of $15. That’s when the ice is supposed to have accumulated overnight as the storm makes its way through our area. 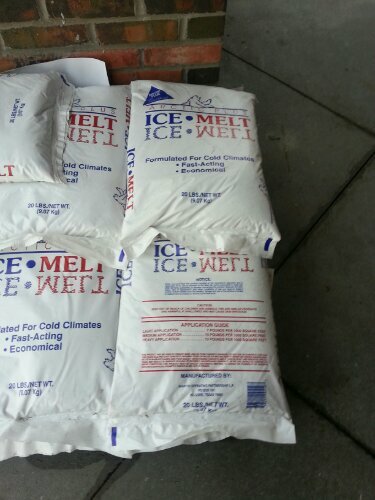 When I got home and unloaded the car, the Ice Melt was the last thing I took out and put away. I carried both bags (40 pounds worth), and immediately I could feel my knees ache. I put the bags inside the house and said to myself, “How in the hell did I carry that ON MY BODY?” And really the better question is, “How the hell did I carry four times that on my body?” because at my heaviest, I was carrying the equivalent to 8 of those sacks and then some PLUS my current weight, so nearly 440 pounds. Once I put the bags down, my knees felt better. But my brain didn’t. I was still puzzling over how it was possible that I carried around that much weight on the regular for such a long period of time. Until you have been morbidly obese, you cannot conceive of this. Until you have weighed what two large adult men weigh, just in ONE body that is only 5’4″, you cannot conceive of this. Until you have had the dull aches in your lower back, the soreness in your hip joints, the grinding in your knees, and the shortness of breath from being winded after only a few steps, you cannot conceive of this. Try it. Try carrying around the equivalent to your body weight in addition to what you already weigh, and you’ll have an idea of what I have carried around ON MY BODY for the better part of my life. You’ll have an idea of what it has been like to be me for the past 25 years. Then drop half of that weight off and walk around. Then you’ll have an idea of what it is like to be me now. Then you’ll understand why every pound gone matters so much to me, whether it is one or ten or one hundred. To finally have a fighting chance at achieving a healthy weight and a healthy, long life is all I really wanted out of this surgery. But I’m getting that and so much more. And for that, I am thankful and grateful. I’m behind on posting about my food…it’s a busy week around these parts as the semester winds down. My protein intake the past two days has been good–between 82-86 grams. I’m keeping my fat grams to roughly half my protein grams. Carbs were higher yesterday than usual, but I kept it to 30 grams today. But here’s what I’ve eaten the past two days. 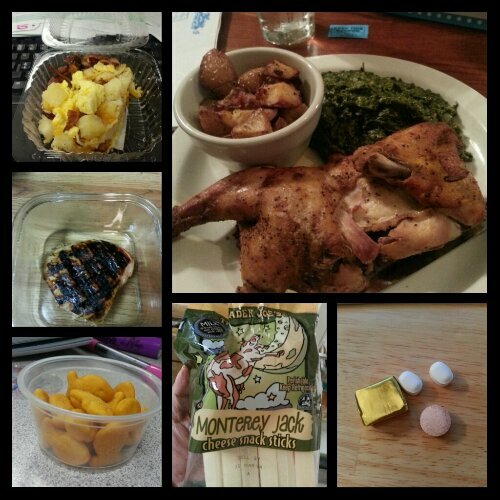 Today’s food choices, from upper right: roast chicken, creamed spinach and pan-fried potatoes; multivitamin and calcium supplements x2, iron supplement; Trader Joe’s Monterey jack cheese stick; Goldfish crackers; grilled chicken breast with green beans (not shown); leftover breakfast bowl. Yesterday was a little carby, but I wasn’t too worried about it. I have been well over my step goal for the past 3 days so it’s all good. I’ve been moving around a lot! 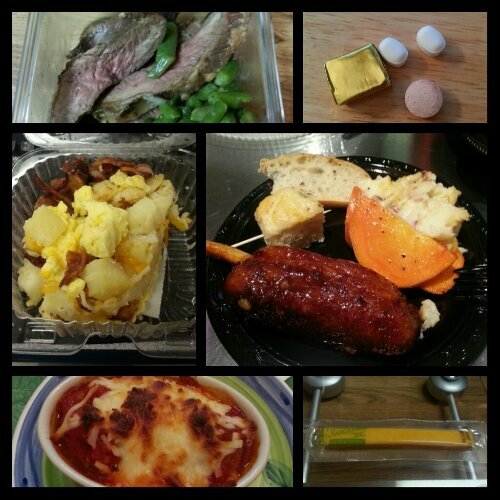 Tuesday’s food choices, from upper right: multivitamin and calcium supplements x2, iron supplement; sticky pork wing, mashed potatoes, steamed carrots and bread slices; Sargento reduced fat cheese stick; Trader Joe’s turkey meatballs in marinara with mozzarella leftovers; breakfast bowl with egg, turkey sausage, bacon, cheese and diced potatoes; honey garlic marinated flank steak and green beans. This entry was posted in being thankful, daily bites, eating, head trips, post-op, reflections, the sleeve, vsg, weight loss surgery and tagged being thankful, daily bites, eating, exercise, get moving!, head trip, live in my shoes, omg I eat carbs!, post-op eating, post-op life, reflections, VSG, vsg realness, WLS. Bookmark the permalink.